Ms Vilayphone Sourideth, Maize Breeder at the Rice and Cash Crop Research Center (R&CCR), National Agricultural and Forestry Research Institute, Ministry of Agriculture and Forestry. Vientiane, Lao P.D.R., has been awarded the 2011 Crawford Fund Fellowship. Ms Sourideth will spend two months at the School of Agriculture and Food Sciences, University of Queensland. Her program there will include learning new plant breeding techniques, analysis and writing up the results of collaborative experiments, conduct of an experiment on nutrient and water use by maize, and presentation of a paper at the 5th World Congress on Conservation Agriculture. Ms Sourideth will also meet and join discussions with private sector plant breeding companies in Queensland. Ms Sourideth studied at the National University of Laos and was awarded a Master’s degree in Agronomy from the University of Lublin, Poland. 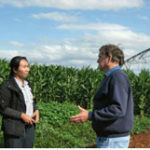 Ms Sourideth has studied maize breeding at the National Maize Research Institute of Vietnam. She is currently responsible for the maize breeding program at her centre where she utilizes conventional and biotechnology methods for maize inbreed line development, germplasm collection and characterization, and waxy maize improvement. She was responsible for research focusing on fertilizer rates for dry season consumptive and feed maize in a joint project with the University of Queensland and funded by the Australian Centre for International Agricultural Research. Maize is increasingly in demand as a feed grain in Laos and other Southeast Asian countries as incomes rise and the demand for animal protein grows in the region.